Five days later the fungus in the container was in high fermentation and the larvae were absent. I removed the slimy, rotting fungi and gently dug into the moist soil I had placed in the bottom of the container, hoping to find at least two or three of the "several" I had spotted in the orange mushroom stems. I found three, then three more, then a pupa. I was amazed to unearth 19 in all, including three pupae. There had obviously been a bunch of them I never saw in the stems. 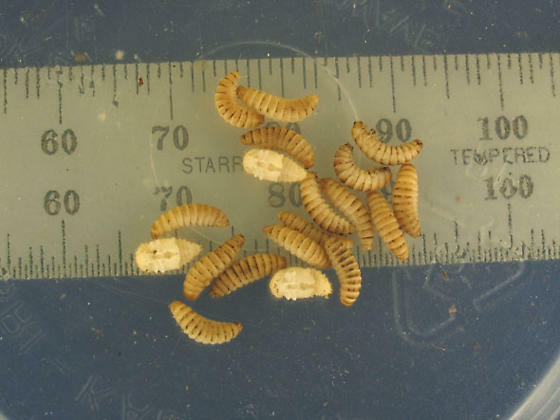 I'm most curious to see what family of beetle emerges from these pupae. They and the larvae are in a smaller amount of moist earth where I can view them twice daily. pupae, I guess we'll find out soon enough!" it looks to him like Eroty*lidae. There are twelve species on the UNH checklist and I know we can eliminate at least two based on size.